Having a sauna is both rewarding and beneficial. It helps you rejuvenate your body, soul, and mind. The item assists you to lose excess weight and also improve the skin tone, boost blood circulation and relieve joint pains, and also improves mood. Unfortunately, you can’t carry with you the sauna that is in your home or at the spa. Well, you can still enjoy the amazing effects wherever you are. 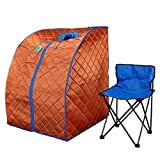 All you need is purchasing a portable sauna tent. It has a decent size to provide a nice environment and is very easy to set up. You will come across quite a number of saunas in the market. And to aid you in your decision making, we have sampled the best portable sauna tents in the market. Let’s look at them one by one! How We Chose These Sauna Tents? Bonus – How To Use & How Does It Work? This portable sauna tent is fit for the home and the outdoors. You can use it while fishing, camping, picnic and in other circumstances. It has a powerful heat generator that operates in 2 levels; 750W and 1050W. Together with the full range of temperature, you can easily choose your preferred effect. The 110V AC unit has a 2-liter water capacity and a timer that operates from a low 10 minute setting up to a maximum of 100 minutes. It has two zippered openings for easy hand movements and a head cover for skin hydration and facial sauna. After using the product, you notice that your skin is brighter, joint pain will be minimal, and your body and mind will generally be more relaxed. 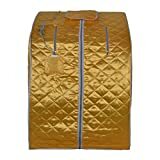 The ALEKO PIN11Y portable sauna comes in a practical size of 37 x 28 x 31 inches and is fit for men and women. The stylish item has a beautiful gold color to enhance the beauty of the surrounding and is made of lightweight materials. The box-shaped unit has an infrared heater for relaxation and soothing the body and mind. It has a nice comfortable chair for seating on when enjoying the therapeutic effects and functional and supportive foot pads. The 1000-watt tent runs via 100-110V AC and has a temperature range of 113-140 Deg F. it comes in folding design for easy movement and storage and has strong carbon fiber panels for support. Who said that you could only enjoy therapeutic healing from the spa or beauty center? With the AW Portable Steam Sauna, you can relax and experience the same soothing effect right from home or outdoors. This unit has a large chair to handle the big people and is also comfortable. The 9-level temperature is easy to adjust to cater for your individual needs. It has a waterproofed cotton cover that stops steam from penetrating through and a detachable frame for quick unfolding, easy carrying, and convenient storage. The 6-level timer is also adjustable while the blue color gives it beauty and also improves the surrounding. You don’t have to worry about missing a visit to the local spa when away from home. With the Far Infrared Akuna tent, you will enjoy similar benefits from anywhere. It comes in a beautiful box shape to cover your body, and the powerful steam generator ensures your skin, body, and mind is relaxed. The Far Infrared waves penetrate deep into the skin and tissues to give you maximum satisfaction while ensuring you stay safe in the process. This is boosted by the 3 mica heating elements and the tourmaline negative ion heater. The foot pad has 3 heating levels and the Temperature Range is between 60℉ and 140℉. The timer has a maximum heat setting of 60 minutes. 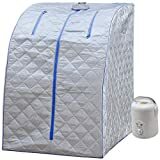 The Durherm Portable Steam Sauna is suitable for home use and comes in a space-saving design for use even in limited spaces. It measures 28(L) x 33(W) x 43(H) inches and offers decent space for most people. The single person unit has an 800-watt heat generator that delivers amazing heat to the user. Despite the excellent heating, it consumes minimal energy to keep the cost of power manageable. 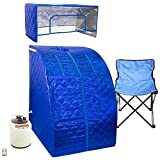 The Personal Folding Sauna has a Blue Outline and looks beautiful and enhances the surrounding. It is lightweight and simple design and setting up or removal takes little effort and time. The included timer has a maximum setting of 60 minutes which is more than ideal for most daily operations. 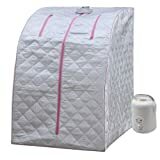 The Durherm Infrared Sauna is not new in regards to the best portable sauna tents in the market. It is has a large size to accommodate even big people but is still very lightweight for natural movement. The accessory emits Low EMF Negative Ions to help rejuvenate and relax the body as well as enhance the skin condition and health. It has a decently-sized footpad that provides good heat to the feet and a comfortable chair for seating on. The canvas material is strong and durable and can handle heavy weights pretty nicely. You can enjoy a nice sauna experience while reading a book or magazine, listening to your favorite tunes, or just relaxing. Controlling the various functions is done via the remote. If you want to burn the excess calories in your desire to lose weight or improve your metabolism or blood circulation, then you should consider acquiring this portable therapeutic Infrared Sauna from Gizmo. The 1000-watt equipment delivers good heating to nourish your skin, improve your health, and also offer you quick relaxation. It uses Infrared to achieve a deeper and longer lasting effect. 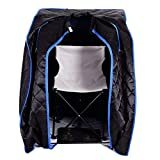 The tent spa is easy to operate and is a matter of following the included instructions. Assembling and disassembling it is equally simple and easy. The item comes with a footpad, folding chair, and simple control buttons. Besides the home, it can be used in other settings. Enjoying maximum relaxation and improving your skin health is no longer a dream. With the DSS-404 personal steam sauna by Durasage, you get a reliable and portable sauna tent. The lightweight piece can be used in many places including the home, campsite, and beach. It measures 28″x33″x43″ and offers ample space for the user. The item is among the easiest to operate and features a stylish design and gray color with a pink or blue outline to suit your individual taste. The 60-minute timer allows you to select the best setting while the 800-watt steam generator provides adequate heat. Once done with it, you simply collapse it to a small size for easy storage and carrying. With the Ridgeyard Portable Spa Tent, you will have a fabulous time outdoors. Simply slide inside the unit and let the FIR infrared waves give you maximum relaxation and comfort. The item is appropriate for a single user and has a basic design for smooth operation. It takes just a few minutes to set up and bringing it down, and folding is also fast and straightforward. It can be used at home, picnic site, campsite, beach and many other places. The portable unit heats up pretty fast to give you quick relief and can reach a maximum temperature of 140 Deg F in less than 5 minutes. The cool-to-touch surface is not only safe but also helps to conserve heat. And as you know, sitting in a sauna for 10 minutes is equivalent to a 30 minutes jog. 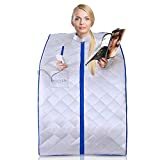 It includes a nice chair and heating footpad and will help you eliminate toxins, improve skin health and texture, and also open up clogged pores. And finally, we have the SereneLife Portable Infrared Home Spa. This One Person sauna is fit for many outdoor situations including camping, the beach, fishing, backyard and more. The silver-colored unit looks terrific in many settings and comprises a tough cover for maximum strength. It allows you to detox, relax, and experience other therapeutic benefits. Setting up and disassembling the item is not only comfortable but also straightforward. In fact, as a novice, you’ll do it in a couple of minutes. It relies on infrared technology that is famed for quick benefits and long-lasting nature. Thanks to the spacious design, even large users will fit inside it comfortably. The smooth interior feels nice on the bare skin and won’t chafe the body. The heat can be adjusted to suit your needs and environments, and you also get a sauna chair as a bonus. Portability: The right item is easy to move from place to place. It is made of lightweight materials and can be folded into a smaller size for easy transportation or storage. Polyester, fiberglass, lightweight steel, and aluminum are some common materials of construction. Size: The items come in various sizes and weight capacities. It’s important to pick one that is perfect for your size or that of the intended user. Too small, and you may found yourself squeezing yourself inside it. Too large and it will waste space or will be cumbersome. Assembly: Top products like the ones above are very easy to assemble. You don’t require any complex tools, and you also don’t need any advanced skills. 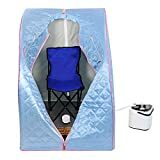 By following the basic instructions that come with the item, you will have the sauna tent up and operating in minutes. Energy Efficiency: With power bills on the rise, consumers prefer products that will help keep costs on a minimum. Good sauna tents are made from energy efficient materials to conserve the heat generated and also don’t require lots of power to run. Durability: A tent sauna, just like other products, should last a long time. It should be able to handle regulate operation, a bit of mishandling, exposure to the elements and more. A good type is built from moisture resistant, abrasion-resistant, and rust/corrosion proof material. It also won’t fade, shrink, or expand due to the steam or heat. The truth is that a sauna comes with many benefits. It helps you to relax and relieve aching joints and issues. It assists in mood enhancement and blood circulation and also boosts the skin tone and appearance. A portable type gives you the many benefits even while away from your home, spa or beauty center. It is lightweight and portable, easy to set up, and works in different places. And to help you make the right decision, we compared the popular types and were able to identify the best. What is now remaining is deciding which one you like most.